Once I found Piedmont on my wine map some 15 years ago I also found the wine I like the most. Not only just because of the wine but also for reasons like the people, the ambiance, the culture and not to forget the food! 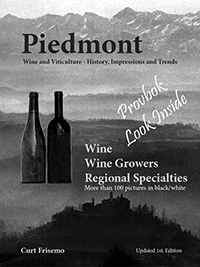 Some years later I wrote my first book about Piedmont, the wine and the growers and some other things. Ich habe erfolgreich einigen Projekte gearbeitet und sogar mit einigen Suchargumenten auf der ersten Google Seite gelandet aber auch auf Seiten 2 bis 4! The books and eBooks shown below are available through links to the actual Internet shop where they could be ordered. The reason for this is that I cannot find a shop in Germany being able to handle eBooks larger than 10MB. The eBooks are in ePub format with a size of 20 resp. 40MB. The size of the eBooks are caused by all the photos being around 100 photos for each eBook. Because of the size of the files I suggest you download them using a fast Internet connection. The eBooks are all in colour with clickable links to wine growers Web Sites as well as other information. The eBook version 1 (first edition) is only in black and white as was the original print version. The print versions of the version 2 eBooks (second edition) are all in black and white. For all the books there is also a 'look into' version, which you can download before you decide to buy or not to buy. If you click on the book symbol in the widget shop below, you will find more information about the book. The prices are noted in Swedish Crowns, SEK, since the distributor is located in Stockholm. The price below of SEK 115 then corresponds to EUR 12,80 using current exchange rate.